Amanda Steinberg, founder of DailyWorth.com and author of Worth It: Your Life, Your Money, Your Terms, recently spoke to me, recently interviewed me about my new book Invested. Here’s our discussion! Amanda: I’m struck that we both wrote very personal books about investing and our lives. Most investing books are pure how-to books. I wrote my book that way because it’s not really about teaching women how to invest, it’s about how we define our own worth and how money is one expression of that. What made you decide to make Invested more of a story? Danielle: Most investing books are extremely boring to me and I’m not going to read them for fun, you know? They feel like work. I wanted to write a book that was the total opposite: a fabulous and very real story that teaches you how to invest along the way. Invested tells the story of my crazy year learning to invest, and addresses all the obstacles I went through – confidence, fear, how the market works, how to choose a company, how to avoid errors, how to build a portfolio, how to buy and how to sell – to transform my life and find financial freedom. My dad loved seeing how I took his investing knowledge and applied it to my own point of view – except when he didn’t, and totally pushed back on me, and I had to convince him – and we put all the ups and downs and fights and frustrations and successes in the book. I had no idea how personal learning investing would become, and if all some readers get out of it is a great read, that’s fine with me. If they start their own investing practice and starting voting for their values with their money so that we change the market and support great companies, I’ll be ecstatic. Investing should be fun, and if I can do it, anyone can do it. Amanda: Choosing investments, which in your case means stocks, that reflect your personal values is non-negotiable for both of us. There’s accelerating interest in socially responsible, or “ESG,” investments. Are you investing in any of these funds, or if not, what makes your approach different? Danielle: We little-guy investors actually own 85% of the money in the stock market, but through funds, which then invest it for us. So, though 85% of the money in the market is our money, we don’t actually control it – we’ve abdicated responsibility for it, and pay people to control it for us. It was a huge turning point in my investing practice when I realized that my money is a vote – my investing dollar is a vote – and I want to use it to vote for companies who are doing good things in the world. It made me feel like a warrior. My vote will be different from your vote, and different from my dad’s vote, and that’s fine. The important thing is that I use my vote myself, and don’t abdicate to someone else or to a computer to vote for me. I’m thrilled that socially responsible investing is becoming more commonplace, but the problem with investing in funds is that you don’t actually understand or choose those companies. Ron Lieber recently wrote a great article in the New York Times about how difficult it is to control what your money is really voting for in socially responsible funds. The only way, in my opinion, to vote with integrity, is to recognize my individual power and vote it myself. There is nothing more important than this idea, because we have tremendous power, if only we would use it. We could completely change the 85% of the market that we control and kick out the amoral companies – because without our money, they would die. It’s a simple as that. But they will stick around, supported by our money, until we take our power back by taking our money back. Amanda: Realistically, though, a lot of people want my services as a financial guide because they don’t trust themselves enough or believe they don’t have enough time. You learned how to invest on your own, by choosing individual companies. How much time do you actually spend researching companies and investing? Danielle: Investing has become a regular practice that adds huge value to my life so, to my surprise as much as anyone’s, I now really look forward to following my companies, reading the business news and, when I have a few minutes, delving into a new company or an industry. I actually get excited about it now. It took some time commitment at the beginning as I learned the practice, just as learning anything new does, and my book carefully details month-by-month how I learned. Now, I spend about 10-15 minutes in the morning to check the news and then occasional weekend time to follow up on a company or research a new one. The crazy thing is what a good part of my life my investing practice is – I miss it and feel disconnected when I don’t do it. Amanda: Were you afraid of starting investing on your own? Danielle: I was completely scared. I did not want to be responsible for losing all my money myself. But by working through the practice of investing, I realized that my fear came from a lack of knowledge and that the entire financial industry is structured to keep me ignorant so I’ll keep paying their fees – but knowledge is truly power. Investing is actually a very simple process. That doesn’t mean it’s automatically easy, but anyone with a brain and the right approach can become a very good investor. Amanda: Invested really delves into family and inherited attitudes about money. Were you planning to get into that stuff as part of your Investing Practice, or was it a surprise? Danielle: It was a shock. I had always thought of myself as having a great, well-adjusted attitude about money. I’ve been rich and I’ve been poor, and I have friends on all sides of the spectrum, so none of it really feels foreign to me. So, I couldn’t quite believe it when I got really nervous about the prospect of making money as an investor. I literally could not picture myself as a successful investor and got huge anxiety about it. I had to literally sit down and really turn inward, and delve into what was causing those anxious feelings. It turned out it was my dad – the very person who was teaching me investing! It was a difficult and emotional process, but I had to go through it in order to be successful in investing, and now our relationship is much better. It taught me how utterly emotional and personal money is – and, often, to avoid dealing with those feelings, we push money decisions off on someone else. But if we’re willing to face those emotions, the transformation is life-changing. Amanda: The biggest thing most people are afraid of is the obvious one that you mentioned – losing their money. You talk a lot in the book about being numbers-phobic and how that also kept you from investing. How did you handle going into investing on your own, but not being confident enough with numbers and math? Danielle: I knew I could apply formulas and equations, as long as I understood their logic. My teacher, though, adores the language of numbers and had a very hard time giving me straightforward equations, so I worked through it with him, and on my own, and put the results in the book. Now that I have those formulas – and I refer to the book all the time! – my confidence is growing with every day of my investing practice. Amanda: The book is written in your voice. Why did you decide to write it with your dad, instead of on your own? 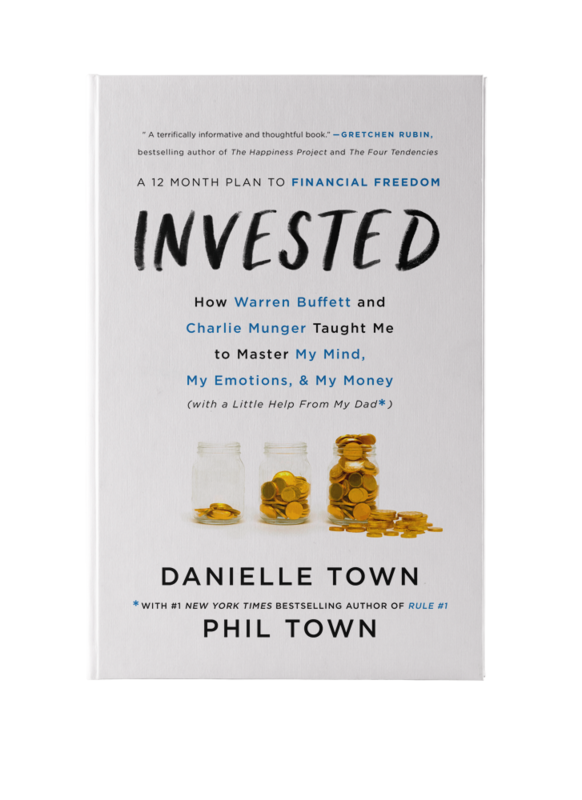 Danielle: We first started our podcast, InvestED, as a way for me to ask my dad any questions I had about investing in a fun format that would be educational for not only me, but anybody learning to invest. The podcast really blew up, we have over three million listens and we discovered there is really an audience for our talks. The book is our way of going deeper into the discussions we have on the podcast and share a window into how a thriving investing practice fits into our lives, so we had to write together. So much of the book is our conversations, sidebars from my dad’s experience, his investing knowledge, and his own investing practice. It was a cathartic process to write together and a lot of what we discovered about ourselves and each other ended up in the book, and only made it better. Amanda: What has the reaction been from your family and friends? Danielle: Gaining control of my finances was a very personal and often very scary experience for me and I was surprised to hear family members and loved ones admit to feeling the same way. Apparently, many of them felt just as intimidated as I did – like the financial world was inaccessible to them, or simply too complicated to be interesting. And these are people who also know my dad! So it’s awesome that, after they read the book, they’ve all said, “Wow! I’ve been listening to you talk about this for years, but this book really makes me want to start investing!” For the first time, they have the tools to begin enjoying the process. That’s really why I wrote this book, to make investing an enjoyable and positive experience for people. It’s rewarding to see the lightbulb go off for them. Amanda: What is one tip you’d want to give people who are thinking about starting to invest beyond their retirement portfolio? Danielle: Trust yourself, because you already have the skills and all you have to do is learn the tools set forth in the book and utilize your strengths. We each already have expertise – probably without even realizing it – that can be used for investing. For me, I discovered I know a lot about yoga products and household products and food products, simply by living life. Well, those products are made by companies, many of which are public and I can buy. There’s no need to even look at something that’s already Too Hard. Stay within your wheelhouse, or Circle of Competence as Buffett calls it, and stick to what you already know simply by being yourself. If you follow what is taught in this book, you will be ready to invest on your own when the time is right, and have the skills to create the freedom you need to live the life you want to live.